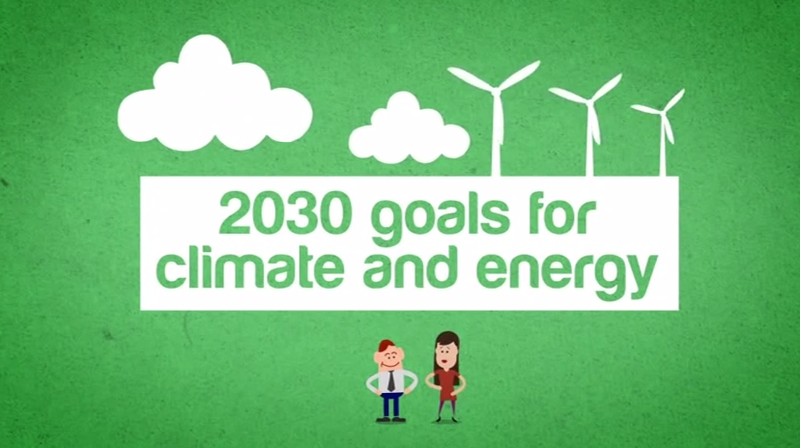 The EU Commission recently proposed new renewable energy and carbon targets. This is great news for Europe. (Well, it would be better if they were a bit more aggressive, but….) The new video above from DG Clima gives a good overview of the new targets and some reasons why such targets rock. For example, it focuses a bit on the economic, jobs, and energy import benefits. “Fighting climate change is a real challenge but it’s an opportunity for our economy as well. Discover how the new 2030 goals for climate and energy will help make the EU more competitive, secure and sustainable,” DG Climate writes. If you live in France, Germany, Greece, Italy, Poland, Portugal, Spain, or the United Kingdom, you’ll notice that the video player above is quite smart and speaks to you in your language. (I just watched it and was quite surprised to hear Polish coming out.) The wonders of modern internet technology. Hopefully the video comes through in English for our many American, Canadian, Australian, South African, and Indian readers! If not, you can watch the English version on YouTube here. Again, the new goals are pretty good (better than we see in other regions). However, there has been some criticism. “While the 27% [2030 renewable energy target] is a step in the right direction, some critics are suggesting that it doesn’t go far enough, specifically in regards to the lack of nationally binding targets,” Joshua Hill wrote for CleanTechnica last month. Sadly, the country where I live (Poland) has been the key opposition to more aggressive climate reduction and renewable energy policies. Ironically, Poland would see a net benefit from such policies. However, its dominant coal industry (which has tremendous influence over the media and politicians) would not, and that’s why the country’s net benefit is overridden time and time again in these EU negotiations.